Image caption Young Fathers said they stood for "openness, kindness and love"
Edinburgh band Young Fathers have won Scottish Album of the Year for the second time. They were awarded the 2018 prize for Cocoa Sugar at a ceremony in Paisley on Thursday night. Other acts in the running included Franz Ferdinand, Mogwai, and Karine Polwart. 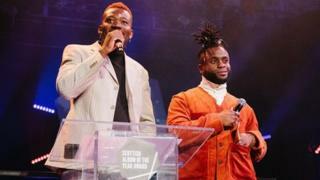 Collecting the award, Alloysious Massaquoi from Young Fathers said it was a "total surprise and an honour" to scoop the accolade again. The band previously won the prize in 2014 for their album Tape Two. They were presented with the award and the £20,000 prize by Vic Galloway and Nicola Meighan at the ceremony held at Paisley Town Hall. Young Fathers were formed in Edinburgh in 2008 by Alloysious Massaquoi, Kayus Bankole and Graham 'G' Hastings. Alloysious Massaquoi added: "We want to thank everyone who voted, it's fantastic for Scotland and diversity in music. "We are obviously a multi-racial group who stand for openness, kindness, and love." Robert Kilpatrick, general manager at Scottish Music Industry Association (SMIA), said: "Cocoa Sugar is a fantastic, world-class record, which showcases the band's incredible song writing talent and musicianship. "They continue to go from strength to strength, defying expectations and creating some of the best music to have come out of Scotland. "A truly well-deserved win from an outstanding, crucially important Scottish act." Alan Morrison, head of music at Creative Scotland, described Young Fathers' winning record as their "most accessible release yet, with pop hooks and soulful vocals emerging from their trademark monsoon of global beats". He added: "Congratulations also to all the nominees who made this such a bold and diverse year for Scottish music."